Some clouds stand out from other cloud formations and deserve your attention. One example is duplicatus clouds. What makes this cloud formation remarkable? Read on to find out. Duplicatus clouds refer to cloud formations distinguishable by its layered structure found at different atmospheric levels. Duplicatus clouds may come in cumuliform or stratiform varieties. Cumuliform clouds grow vertically just like cumulus clouds, while stratiform clouds are characterized by having massive horizontal development. Duplicatus cloud got its name from the Latin word duplicatus which means doubled. At What Height is Duplicatus Clouds Found? Duplicatus clouds can be found in two atmospheric levels simultaneously. These clouds are visible anywhere between 2,000 feet and 20,000 feet or higher above the Earth’s surface. Spotting them at low-level altitudes is somewhat tricky because the lower overlapping layer often blocks out the higher layer. However, duplicatus cloud formation is highly recognizable at the middle level clouds especially if the sun is quite low in the sky. The glimpsing angle of the sun makes one layer darker while the other layer is covered in crimson shade. Duplicatus clouds can be categorized into several forms. 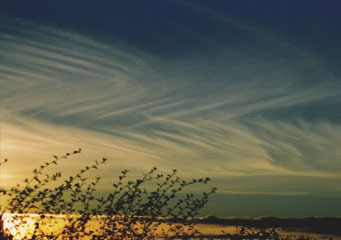 Cirrus clouds are often visible in duplicatus structure emerging at high elevations. This form of duplicatus cloud appears in doubled layers of cirrus clouds. Furthermore, some manifestations of cirrus uncinus and fibratus come in the form of duplicatus clouds. Duplicatus clouds appearing as cirrostratus duplicatus is recognized through its threadlike or fibrous appearance. This is due to the fact that cirrostratus duplicatus is largely made up of ice crystals giving it its transparent look. The cloud layers appear in striking crisscross pattern. This duplicatus cloud has multiple layers of stratocumulus clouds placed on top of each other. It is largely made up of water droplets instead of ice crystals. One layer is too dense thus blocking the view to the higher layer. However, it is also possible to see the cloud separated in two layers when the higher level is seen through a space in the lower layer. Duplicatus in altostratus cloud appears less dense making the lower layer darker due to the Earth’s shadow and the higher layer taking on a garnet hue. This cloud formation appears in multiple layers of altocumulus clouds. Though they are quite larger, altocumulus duplicates clouds do not completely cover the sky. These cloud structures can generate the most wonderful lingering sunsets. How common is Duplicatus Clouds? Duplicatus clouds are very common all over the world. They bring sporadic light rains or snow showers. So whenever you see cloud formations in layering patterns, you are gazing at duplicatus clouds.